Description: Highly significant map of Iedo or modern Tokyo from Kaempfer's account, the most detailed European description of Japanese life and culture before the mid-19th century. Description: Hydrographic sketch map of Tokyo and its environs. Printed colour. 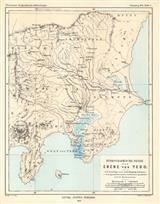 Description: Vintage map of Tokyo and its environs, including Yokohama and Mt. Fuji. Printed colour.